Argentina-Ok, let’s be serious. This is all about Lionel Messi. I imagine that this will be his last chance to claim a World Cup and finally escape the large shadow cast by the great Diego Maradona. That could happen if Messi gets the support from the likes of Angel DiMaria some consistent goal scoring from Gonzalo Higuain and if manager Jorge Sempioli can find a way to successfully integrate Paulo Dybala into a cohesive midfield. But is this version of the Albicelste deep enough? Are the resilient enough? Are they strong enough and quick enough defensively? Will the psychological toll of having lost its last three international tournaments in the final round, twice on penalties be too heavy or fuel their motivation for another deep run? Whichever it is, I’m looking forward to Messi (who rescued Argentina in the round of qualifying) weave his magic again with the ball at his feet and defenders at his mercy. Brazil-Speaking of psychological tolls, this tournament is all about redemption for O seleção. Forget the final four years ago or any other match for that matter; 50 years from now people will still be talking about the 7-1 smackdown Brazil suffered in their own building at the hands of the eventual champions Germany. Only six players from the 2014 squad are back this summer: Marcelo, who’s turned into the best left back in the game, Fernandinho, Paulinho, Willian, Neymar (pictured) and Thiago Silva. After a slow start, Brazil sailed through CONMEBOL qualifying after the appointment of Tite as coach, losing just one match to Chile and finished10 points clear of second place Uruguay. Neymar’s long injury layoff at the end of an indifferent season for PSG may be a blessing for Brazil in that they cannot rely so heavily on him as they did 4 years ago. Manchester City’s Gabriel Jesus scored seven goals during qualifying and Robert Firminho (Liverpool) acquitted himself well during qualifying but Brazil’s midfield featuring the likes of Casemeiro (Real Madrid), and Phillipe Coutinho (Barcelona) are going to be counted on to provide the stability that at times eluded the hosts four years ago. Brazil will always be good but whether they are truly back remains to be seen. Colombia- Los Cafeteros, led by the supremely talented James Rodriguez (pictured, left) won’t be catching anyone by surprise this time around. The South Americans salsa and slashed their way to the quarterfinals in 2014 and despite some initial inconsistency easily qualified for successive World Cups for the first time since the days of Valderrama, Asprilla and Rincon. Rodriguez is back, Radamel Falcao will have his shot in the Big Show, having missed out through injury 4 years ago and one of my favorites, Juventus’ Juan Cuadrado (pictured, right) a big time talent on the right wing, is back as well. This generation of Colombian players has erased the bitter memories of Andres Escobar from 24 years ago and now will look to cement their own status as legends with a deep run in the tournament. Death, Group(s) Of- While there a few groups that are set up nicely for some of the favorites (Group G for Belgium, E for Brazil and C for France) there are also two groups that seem to be wide open. Unless something crazy happens Group F will see Germany advance. But the fight for second place will feature one of the best sides El Enemigo has put together in quite awhile, a Sweden side that bested Italy in a two legged playoff and a S. Korea side that is always competitive. The other Group of real interest will be Group D with 2014 finalists Argentina playing Nigeria for the 3rd consecutive time and 5th time in total ( ’94, ’02 ’10 ’14) the always talented Croatia and Euro16 quarterfinalists, Iceland. Argentina figures to lead the group but the remaining teams are all capable of claiming second place in what should be an excellent set of matches. England-I’ve often tagged this side as a disappointment given its consistent underachievement at major tournaments despite its reputation. After a forgettable Euro 2016 that ended with that loss to Iceland, the 3 Lions, come into a World Cup in an unfamiliar role: a team with absolutely no expectations. Gone are the Gerrards, the Terrys, Rooneys and even Joe Hart and in step the likes of Dele Ali, Harry “Big Daddy” Kane and Raheem Sterling (pictured); a squad of very good players but not considered world beaters. But maybe that’s what the England need, to be completely under the radar and relieved of the pressure that normally looms over them in international tournaments. Grouped with 2014 Quarterfinalists, Belgium as well as Tunisia and Panama, they should be able to advance to the Round of 16 where they would theoretically meet up with Colombia. 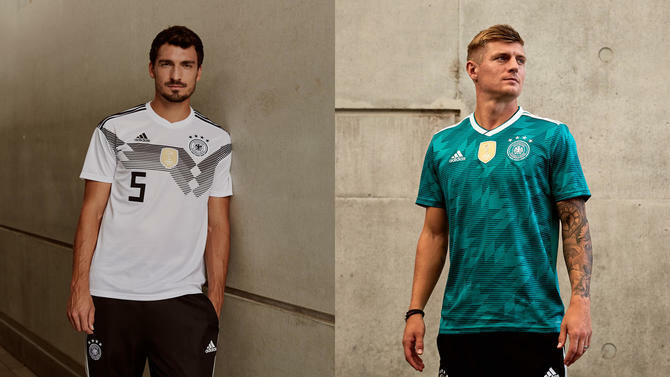 Germany– The favorites going into this tournament, Die Mannschaft have a legit chance of becoming the first team to repeat as World Cup champions since Brazil almost 60 years ago. Stalwarts like the venerable Phillip Lahm and Miroslave Klose have retired and but the Germans seemingly haven’t missed a beat, dominating their qualifying group, winning the Confederations Cup using only U-23 players and only going out of Euro16 on penalties. This team is scary good and returns the likes of Thomas Muller, Toni Kroos, Jerome Boateng (pictured), Mesut Ozil and Manuel Neuer in goal. Leroy Sane was shockingly left off, as were Andre Scherler and Mario Goetze who played important roles in the knockout matches in 2014 but fans will finally get to see Marco Reus who missed out through injury four years ago and expect to see a bigger role for PSG’s Julian Draxler. In my mind, it’s Germany’s tournament to lose but it remains to see how hungry this group is to repeat and how well they execute against some other very talented sides. Haters-There out there. They can’t wait to try and damper your enthusiasm for The Big Show with: Soccer is Boring. I don’t understand the rules. It’s just kickball. This is a game for White people and Mexicans. There’s no action in soccer. What are you, some sort of communist? Soccer won’t work here. Why are there no commercials? I don’t drink that much so I’m not doing any drinking game but perhaps I can put together a bingo card with all my favorite soccer hater sayings…Be Gone, Haters. Your Existence is Chafing Me. Joachim Löw-Admit it. You’re going to watch Germany’s matches to see if he does the Scratch and Sniff thing again. Kevin DeBruyne– “Like the Motion of Water…smooth” American fans remember him as the first Belgium player to finally breach Tim Howard’s goal in that epic R16 match four years ago but most of the world knows him as the influential midfielder for Manchester City who tallied 20 assists in all competitions for the English champions in 2017-18. Gliding off the right wing, he can pick apart defenses with his passing and seems almost effortless with the ball at his feet. Eden Hazard and Romelu Lukaku will get the goal scoring plaudits but if Belgium has a deep run in them, DeBruyne is going to be the one to orchestrate it all. Luis Suarez-Admit it. You’re going to watch all of Uruguay’s matches just to see if he bites someone again. Mexi…er…That Team Down South- Time to see what El Enemigo is truly made of. That Team Down South breezed through qualifying, dropping only one match (conveniently on the final day where a tie would have kept the US alive) and re-established itself as Los Reyes de CONCACAF. Now comes the hard part. They open against defending champions Germany, and are grouped with Sweden and S. Korea, meaning qualification to the Round of 16 (where a potential foes include Brazil and Costa Rica) is not guaranteed. Still this is, by far, the best and most experienced side since perhaps the 2002 team and will be a handful with likes of Chicharito, Carlos Vela (who will finally appear for Mexico at a World Cup) Andres Guardado and Hector Herrera. Juan Carlos Osorio has been on the hot seat since he took over as manager and the glare of the spotlight will be on him as much as it is the players. Interesting tournament ahead for El Enemigo. I’m still cheering for whomever they play against. Yes I’m petty. Nigeria-Africa’s most consistent World Cup participant over the last 20 years, the Super Eagles have been drawn into a difficult group (see D above) which includes, once again Argentina. Nigeria cruised through their qualifying group which included the likes of Cameroon, Zambia and Algeria and their only loss came through the use of an ineligible player who had not served a long enough red-card induced ban. This band of Super Eagles, however, lacks the match winning star power of a JJ Okocha or Nwankwo Kanu and instead will rely on the collective talent led by veterans such as John Obi Mikel, Victor Moses, Ahmed Musa (who scored twice against Argentina four years ago) and younger players like the talented Alex Iwobi (pictured) of Arsenal. Nigeria is going to need to get their points against an always solid Croatia side and the Iclandic upstarts before meeting the Albiceleste in the final group stage match. But given those brilliant jerseys they’ll look good no matter what happens. Offsides-The one rule that always seems to baffle people who watch soccer once every four years (except those who watch hockey and equate the last defender with the blue line) , few calls are more disputed than the offside call made by the assistant referee with flag on either sideline. Like the offensive foul in basketball it is a play that happens in a split second and requires a good eye and proper positioning by the linesman. I could explain it but this diagram does illustrates it perfectly. At the moment the ball is played by #11 in red, 10 in red is OFFSIDE. 8 is ONSIDE. Pogba, Paul-Paul Pogba’s reputation is on the line. Yeah I said it. One of the most talented players on the planet, his brilliance has not shone consistently since his move to Manchester United. Playing in a more advanced midfield role with France, the World Cup will afford him his opportunity to show of what he is capable. Will he seize this moment and help inspire a very talented French side looking to atone for their shocking loss in the Euro 2016 final? Or will we see only flashes of brilliance that have left Manchester United fans perplexed at his inconsistency? He’s already been dismissed as overrated by Denmark’s coach. I imagine he’ll be ready. Russia-“We go to new lands.” So said former Grand Poobah Sepp Blatter when both Russia and Qatar were named as hosts for 2018 and 2022 respectively. Russia will host the first World Cup to be held in Eastern Europe and their second major event in recent times having welcomed the world for the Winter Olympics four years ago. While no one is doubting this historic country’s ability to host the games, their selection has not been without controversy. There has been a steady increase of hooliganism which was on full display at Euro16 when they instigated a major rumble with England supporters. Several Black players from England’s squad have voiced concern for their families for fear of racial harassment; Danny Rose has flat out told his family not to come. Questions of corruption regarding the awarding of the tournament to Russia were summarily dismissed by Vladimir Putin (AKA Leader Deslok) but a recent report regarding the involvement of Vitaly Mutko who was implicated in the host country’s doping scandal shows that the controversy swirling around this tournament is far from settled. But you know what? Good luck to them anyway. Just as there were questions in the run up to Brazil 2014 and South Africa in 2010 it’s the football that matters. Let’s hope that the football will ultimately be what is remembered and not issues outside the stadia. Salah, Mohammad-All eyes will be on the expected African Player of The Year as he leads the 5-time African Champion Pharaohs to their first World Cup appearance in 28 years. Salah, who scored the penalty that sent Egypt on through to Russia, enjoyed a torrid season for Liverpool, leading them to the Champions League Final only to be “Sergio Ramosed” and forced to leave the match early with a shoulder. He will be fit enough to play in Russia however and will look to combine with the likes of Ahmed Hassan and Anderlecht’s Mahmoud Hassan to advance out of Group play where they just might meet up with…Spain and Sergio Ramos. Teranga, Lions of (Senegal) After 16 years, it’s a return to the Big Show for Senegal. The Lions of Teranga delivered the first surprise of the 2002 World Cup by shocking defending champions France on their way to the quarterfinals and are now back in the World Cup, coached by Aliou Cisse, the captain of the 2002 squad. Led by Liverpool’s Sadio Mane as well as AS Monaco’s Keite Balde and captained by Cheikhou Kouyate, Senegal overcame a relatively easy qualifying group and some suspecting officiating during their away match to South Africa to qualify and will face off against Poland Japan and Colombia. A fast start might see them on their way as they seek to equal the exploits of a prior generation. Uniforms-As my brother once said, “It’s All about Packaging”. Teams always break out new and interesting uniforms for the World Cup and this year is no exception. While we love the classic Albiceleste stripes of Argentina, the recognizable Canary yellow of Brazil, England’s simple Red and White and even the unique checkboard design of Croatia, other squads have some interesting designs that will have their fans at home rocking for years to come. 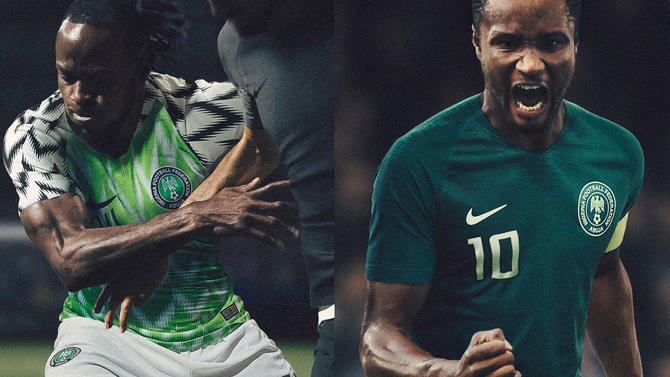 I like Germany’s home uniform, Senegal’s green jersey and even the dark green jersey being worn El Enemigo but the best of the lot has to be Nigeria’s home jersey which sold out in just a few hours after its release. Wish You Were Here– As always there were teams and players that you would expect to be at the World Cup and making an impact. The Netherlands never reestablished themselves after their 3rd place finish four years ago and made neither Euro2016 nor this tournament. Four-time champions Italy could not overcome Sweden over two legs and will be missing for the first time in 60 years. After falling on penalties to host Brazil four years ago and capturing the Copa America and Copa Centenario in successive years, a 3-0 defeat on the final day of qualifying saw Chile go from third to sixth and missing out entirely. The less said about the US, the better. Notable individual players that weren’t invited by their teams? We got those too! No love for likes of Chelsea’s Alvaro Morrata (Spain), Arsenal’s Jack Wilshere (England), Juventus’ Radja Nainggolan (Belgium) PSG’s Adrien Rabbiot (France) and most shockingly Manchester City’s Leroy Sane for Germany. In 29 matches, Sane (pictured) tallied 14 goals and 15 assists this past season for Man City, good enough to waltz into anyone’s team but Germany’s apparently. X-Clan: VAAAAAAAAAAAAAAAAANGLORIUS. This preview is protected by the Red, the Black and the Green. With a KEY! Youth vs. Experience-With an average age of 25 years 337 days, Nigeria has the tournament’s youngest team, just ahead of England and France. Argentina has the oldest team, age-wise. Essam Al-Hadary of Egypt is the oldest player at 45 and also the most capped while Daniel Arzani is the youngest at 19 years and 161 when the Socceroos begin play. Belgium has the team with the most caps by average of the favorites that includes France, Spain, Argentina and Germany. England have the youngest team when combing age and caps while Costa Rica has the oldest. Zlatan– Is it bad that I’m sort of hoping that one of Sweden’s forwards can’t play so that Zlatan gets to go to the World Cup? There it is. Russia will host, Germany will defend. 32 teams will compete and billions will watch. Roll the ball out there and let’s play some football!